Photos and information provided by Mariana Syrotiak. 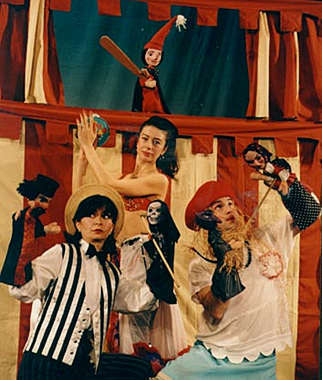 Daniel Stancius "Marioara and Vasilache" show, with puppets made by Adrian Stefanescu, was created in 1995. It has met with great success in Romania where it has received two prestigious awards. The show has been presented in numerous festivals in Romania and elsewhere including a tour of Denmark in the summer of 1998. In addition to the success of Daniel Stancius show, two Romanian puppeteers who are now Canadian citizens, brought the "Vasilache and Marioara" theme with them to Canada where they have adapted it for a French - Canadian audience. "Vasilache and Marioara" are now " Mariette and Basilon" and are being well received in Canada. Photos: top, "Vasilache and Marioara", 1995; bottom, Daniel Stancius "Marioara and Vasilache" show (clockwise): Anca Oprisan, Violeta Badicescu and Daniel Stanciu, 1995. Current members of the show are: Daniel Stanciu, Daria Ganescu and Liliana Gavrilescu.